Good Morning! I’m Mary and I am excited to be joining in on this years #write31days2018 Challenge! The influence of who we are can be the initial impact on others. How we look at our own lives speaks volumes to those around us. So let’s go deeper into who I am before I tell you what I’m going to be writing about this month. well I thought it might just be easier to do this in bullet points. First of all I am a child of God and have been since I was 4 years old. My relationship with Jesus has played an intricate role in my life and is the very reason why I do what I do! At 16 I answered the call into full time ministry- at the time I thought it was missions but more on that later. I am married to my pastor husband Ron. we have been in our current ministry for almost 10 years. we love our people and serve them with everything we’ve got. we are parents to four amazing kiddos. T is 13 (Boy) K is 12 (girl) J is almost 11 (boy) S is 8 (boy). J has autism Spectrum Disorder and S has central Auditory processing disorder. I tell you that for two reasons 1) it helps you, the reader understand the dynamics of our family. 2). when you read my blog you will understand that these are HUGE areas of influence in my life!! As a teenager I lost partial eye sight. I was diagnosed with age related Macular Degeneration at 13 and was the youngest documented child to have it in the United States at the time. I’m not only a pastor’s wife! I currently volunteer at a local Crisis pregnancy Center. mentoring in two areas expectant mothers and Parenting. I have there for 3 years and I love it. I love to Blog. Though time and circumstances have played a huge role in me not blogging a lot over the past couple of years it is still a happy place. I am currently working to bring this habit back into my life. I LOVE to read and learn…..about anything really. Though reading tastes have changed over time I love to be in multiple books at the same time. I am an introvert. I can be around people to but over time if I am involved with people a lot I can get burned out. I have no problem being up front, and I actually prefer it. I just need to recharge after a lot of people contact. I am an animal person. we have one dog and 3 cats. Rosie is our chocolate labradoodle and Daisy, Mia and Tia are our 3 cats. BUT I have always secretly wanted some Crazy exotic pets. Ya wanna know what they are….A chimp- as in a monkey. An otter. Poison Dart Frogs (my fave animal of all in this entire world) a lemur. cockateels. a parrot. a penguin. On second thought I should have just become a zoo keeper. I have been on multiple missions trips. 3 to NYC and one that landed me half way around the world in a country that is closed. I am severely lactose intolerant. I have a Bachelors in Bible and Church ministries. My favorite cities to visit are: Nashville, Washington DC, NYC, in that order! I love to write….in journals, on my blog, in my planner. My fave is anything that involves a piece of paper and a pen bonus points if it’s pretty paper and a G2 pen. So now that you know more about me, let’s talk about my topic of choice. my topic is “the Power of Your Influence”. This past year Influence was my word for the year. and it has been the most powerful one yet. and so many times people say that, but this…this one word has changed my life forever. and the funny thing is that after this summer I realized this one word has been impacting my life since the day I was born…..the even more interesting thing, is that is has been impacting your life too. We have been influenced by the people we hang out with, or even the lady scowling at you from behind the counter at the pharmacy. We don’t always have a choice about what influences us BUT we do have a choice how we influence others. What? So You Say You Aren’t An Influential Person. I have heard that a lot over the last 9 months. All sorts of people have tried to convince me they aren’t influential. The truth of the matter is if You breathe, you are influential. The bigger question is, “Are you a positive OR a negative influence? Now I must warn you that we will be looking at this through the filter of Biblical influence. I have found myself telling those I mentor and work with, including my children is that we have choices to make. THOSE choices are what influence those around us. Your choice to smile versus scowling at the poor unsuspecting passerby influences them. Maybe they needed to see someone smile their way. Maybe they needed a real “how are you” to know someone actually cares about them. We are all guilty of asking that and only wanting the “I’m fine”answer. When we start paying attention to how we make choices, we begin to see life differently because we are taking our eyes off of ourselves and onto others. which is what Jesus commands us to do.He wants us to see people through His eyes. He wants us to love them unconditionally! 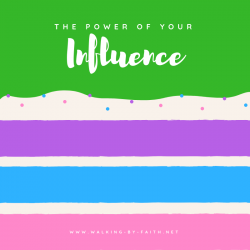 So will you join me on this journey of learning juts how powerful YOUR influence is? Is there a person from the Bible who has Influenced you most? To find out mine go check out the comments…HINT it is where we will start tomorrow! Interested in joining in the writing Challenge check out the Write 31 Days website. This entry was posted in #write31days2018 and tagged #write31days2018, influence. So one of the people in the Bible who have influenced me the Most is Esther. She just downright fascinates me. a Young girlkidnapped and carried off to the kings palace forced into marriage and yet her choices influence generation after generation. More on this amazing woman beginning tomorrow.